This article is about the Holy Cross football stadium. For the baseball stadium, see Hanover Insurance Park at Fitton Field. Fitton Field is a football stadium in Worcester, Massachusetts primarily used for College of the Holy Cross sporting events. The stadium opened in 1908 as the official home for the Holy Cross Crusaders football team. Before that, most games were played on adjoining the baseball field. Named after Reverend James Fitton, who donated land to the Archdiocese of Boston to found the college, it is an irregularly shaped three-sided horseshoe on the edge of the college's campus. The northern football stands are shorter than the southern due to Interstate 290 being adjacent to the field. Officially known as Fitton Football Stadium, the football facility is a 23,500-seat stadium, home to the Holy Cross Crusaders football team. The field itself was used as the football field, and termed Fitton Field, as early as 1908. A wooden structure was constructed at that time, but a more sturdy concrete structure did not appear until 1912. In 1924, the concrete was replaced with the steel structure that still stands today, increasing the stadium's capacity. 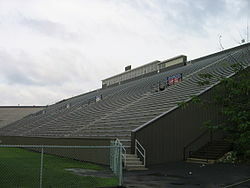 It would remain identical until 1986, when the wooden seating was replaced with aluminum bleachers, further expanding its capacity to its current level. In 2016, new sod and new netting were installed. 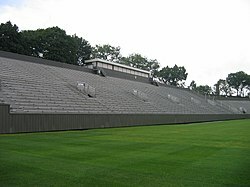 Fitton Field was used to film the movie The Game Plan in 2006. ^ a b c d e f g h i "Fitton Field". GoHolyCross.com. College of the Holy Cross. Retrieved August 18, 2018. ^ Duckett, Richard (October 19, 2006). "Fitton Field plays key role in new film". Telegram & Gazette. GateHouse Media. 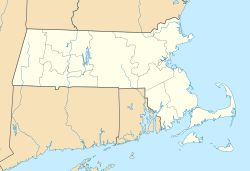 Wikimedia Commons has media related to Fitton Field. "Athletic and Recreational Facilities". www.holycross.edu. College of the Holy Cross. 2018. Retrieved August 17, 2018. "Holy Cross Facilities". GoHolyCross.com. College of the Holy Cross. Retrieved August 17, 2018. "Fitton Field". GoHolyCross.com. College of the Holy Cross. Retrieved August 17, 2018.